Young-adult authors have conquered science fiction with a mixture of angst, romance, and the discovery that adults are wrong. But Cory Doctorow's Hugo/Nebula-nominated Little Brother puts a geeky, subversive spin on that formula. Spoilers! Little Brother is set five minutes into the future, when terrorists blow up San Francisco's Bay Bridge and the BART tunnel. This brings about a huge crackdown, with tons of American citizens being rounded up and imprisoned in a secret prison on Treasure Island - or shipped off to foreign countries to be tortured. The novel's main character, Marcus, is a snarky teen hacker with authority issues. And that's before he gets locked up and abused by the Department of Homeland Security, and his friend Darryl disappears for good. That event transforms Marcus from a minor-league hacker to a major dissident and subversive element. Marcus is a classic Doctorow protagonist: snarky and pissed off, but with an amazingly tender heart lurking just below the jagged armor. He launches a quixotic crusade to make the American government spooks pay, which starts out by "jamming" the government's attempts to profile people based on their travel and purchases, and gradually grows into far-reaching civil disobedience, and a massive network of young people communicating via hacked xBoxes. Many, if not most, young-adult science fiction novels take place in a dystopian or post-apocalyptic setting, where the grown-ups have long since stopped asking questions about the evil overlords and their excessive overlording. The twisted genius of Doctorow's novel is that it starts out in our world, more or less, and then shows how easily and quickly it transforms into a dystopia. The "Panopticon," in which observation and spying are constant companions, becomes an alarming reality in Little Brother. It turns out all of those devices that make your life easier, like transit fast passes, credit cards, and RFID-enabled tags, allow the government to track your every movement. And anyone whose movements falls outside normal patterns can be arrested - or simply made to disappear - unless you can "prove" that you're not a terrorist. And the adult characters in Little Brother quickly become inured to this crazy surveillance regime, accepting it as a necessary evil to stop those awful terrorists from destroying our way of life. Marcus' dad, in particular, goes from being a critic of the government to an apologist for the Homeland Security fascists. And adults who do encourage dissent, such as Marcus' Social Studies teacher, tend to lose their jobs or vanish some other way. "They say they don't have a name. I've got one for them. Let's call these spoiled children Cal-Quaeda. They do the terrorists' work on the home front. When — not if, but when — California gets attacked again, these brats will be as much to blame as the House of Saud." Leaders of the anti-war movement denounced us as fringe elements. One guy went on TV to say that he believed we had been fabricated by the DHS to discredit them. And meanwhile, Doctorow doesn't neglect the "love story" portion of the young-adult formula. Through his rabble-rousing, Marcus meets the defiant Ange, who's just as radical and brilliant as he is, and they bond over spicy food, loud music, hacking and civil disobedience. Compared to the Orwellian nightmares of the main storyline, the Marcus-Ange love story feels a bit less urgent, but it still has moments of genuine sweetness and gives us another reason to root for Marcus in his struggle. You can tell Doctorow was a staffer at the Electronic Frontier Foundation, the techie civil liberties organization. He mentions EFF a number of times in the novel, and the book is full of helpful little asides where Marcus explains the ins and outs of surveillance, hacking and computer security. Major spoiler: The only real problem I had with Little Brother was the happy ending, which felt a bit forced. It actually reminded me of the fake happy ending in Terry Gilliam's Brazil, and for a moment I thought Doctorow was doing something similar - I thought Marcus was fantasizing this happy ending while he was being tortured by government goons. I felt a bit let down when I realized the happy ending was "real," and there's a part of me that still imagines the book's narration panning back from Marcus' comatose face, as someone says "He's gone." 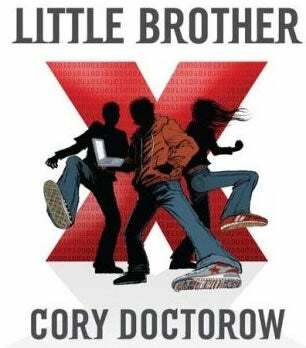 But generally, Little Brother represents a great step forward in the burgeoning subgenre of dystopian young-adult SF. It brings a greater degree of political sophistication, geekiness and civil disobedience to a genre that was already serving up a milder dose of rebellion. After this, no YA novel will be able to get away with watering down its youthful revolution. Little Brother was nominated for Hugo and Nebula Awards. Read more of io9's coverage of 2009's book award nominees here.